BRYAN EATON/Staff photo. Youngsters from Camp Kent, one of the locations of summer programs run by Amesbury Youth Recreation, have been heading to nearby Heron Pond Farm in South Hampton, N.H. to experience farming. 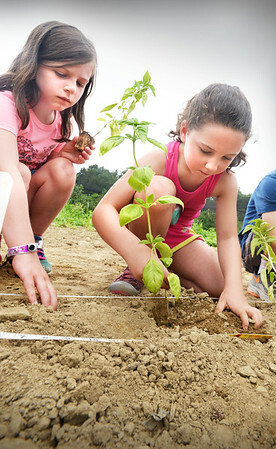 Kaely Broderick, 7, lef, and Kenzie Cameron, 6, both of Amesbury put basil plants in the ground and will check the progress of them over the summer.